Salut tuturor. Zombie.IlegalZone.Ro organizeaza concursul The Most Active Player of The Week. Concursul va incepe pe data de 10 aprilie 2019. Si se va sfarsi pe 17 aprilie 2019. La acest concurs pot participa toti jucatorii care si nu grad pe server si cei ce au helper sau slot. Cei ce vor sa participe, sa scrie aici in topic: "Particip"
Hello everybody. 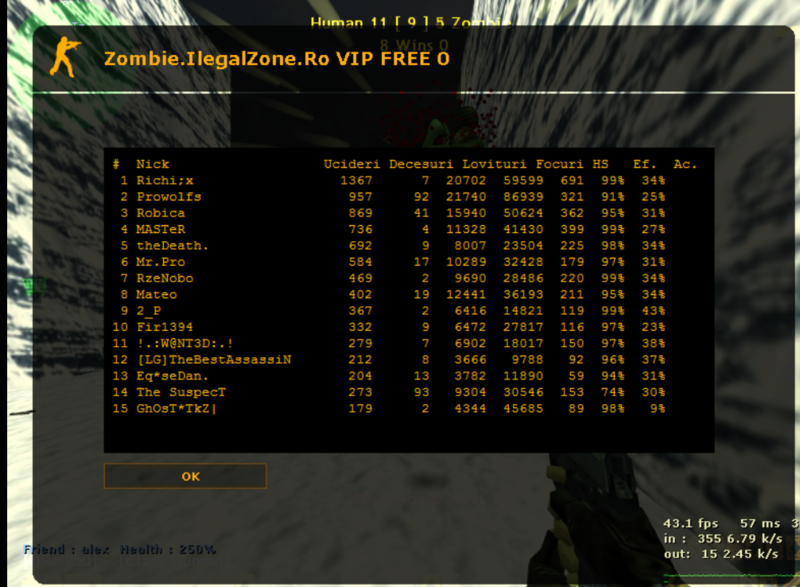 Zombie.IlegalZone.Ro organizes the Most Active Player of the Week contest. The contest will start on April 10, 2019. And it will end on April 17, 2019. All players who do not rank on the server and those with a helper or slot can participate in this contest. Those who want to participate, write here in the topic: "Participate"
Edited by Ƭяαƒƒιcкєя Oƒ Ɗяυgѕ, 10 April 2019 - 05:13 PM. Edited by Ƭяαƒƒιcкєя Oƒ Ɗяυgѕ, 12 April 2019 - 12:51 PM. Ai VIP. Nu poti participa. Pana la terminarea concursului + gg eliminat, joaca cu prostii. Nu avem castigatori din pacate. Mult succes data viitoate !